When talking about saunas, one of the things that have big influence on your experience are sauna rocks. These are an integral part of any sauna setting, and can really improve or ruin the whole thing. They keep the sauna hot and the temperature at a stable level, so you can enjoy all the advantages of a sauna. Whether you’re constructing a new sauna and need rocks for your heater, or you need to replace old stones, you need to get a quality product. This is why we selected some of the best sauna stones available, to try and make your choice a bit easier. In addition, be sure to check out the buying guide and learn more about sauna rocks in general, so you know what to look for. We begin with a package of excellent sauna stones from Fino Sauna. This is dolerite rock, and you get 42lbs of it in different sizes. Related to size, some users have reported that some rocks in the box were too big for their heater, so they needed to break them down. This shouldn’t be a problem for you, because the product itself is very good. 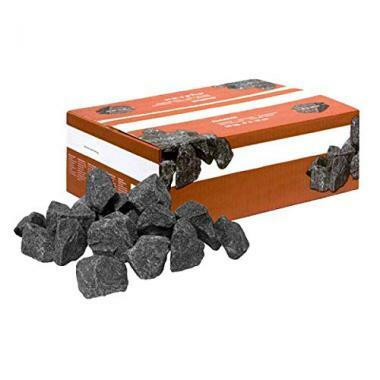 These rocks hold heat exceptionally well, and unlike many others they withstand fast heating without any problems. For this reason you can use them on high output heaters. They are also a great choice for your home sauna. However, keep in mind that you will possibly need two boxes if you have a large heater. They come clean (you won’t need to wash them thoroughly), and truly work like the manufacturer promises. With all this in mind, these are probably one of the the best sauna rocks you can buy right now. The Sauna Palace gives us a really good package of high-quality stones, weighing 45lbs. They can be used to replace your old ones, or for your new sauna heater, since they are the perfect choice for any situation. This product is very popular among customers, thanks to both it’s quality and the great customer service the manufacturer provides. It’s peridotite stone, which holds heat exceptionally well and creates a nice, soft steam allowing you to have all the sauna health benefits. This vulcanite stone also shows great durability, so you can count on it to last a long time without any cracks. It’s really dense, gets hot fast and has no problems even if you frequently pour water over it. The product is imported from Finland, and you are probably aware that they know a thing or two about saunas. If you’re looking for reliability and longevity, these are probably the best sauna stones you’ll be able to find. These top rated sauna stones are a great option for any sauna. They have optimal sizes and shapes, so you can easily arrange them over your heater in any way you want. This allows good airflow which is crucial. Furthermore, they excel at keeping temperature, so you will be comfortable in the sauna throughout your session. The steam is very rich, which is always a plus because you get a perfect hot and humid experience. 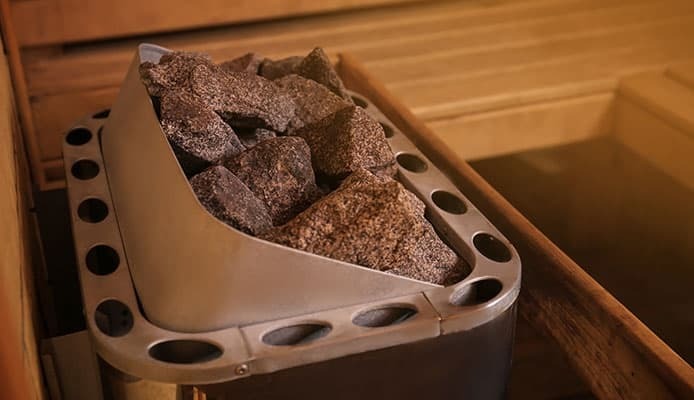 SSBAG heat stones get hot quickly, making your sauna more energy-efficient since the heater can be turned off sooner. Rocks are very high-quality, and you don’t have to worry about any cracks or problems of that kind. On top of this, they look very nice too. As we mentioned at the beginning, stones play a very important role in your sauna. They hold the heat, preserve temperature and they are also responsible for the steam we enjoy so much. However, not all rocks are the same. There are certain characteristics that make some types of rock perfect for saunas, while at the same time eliminating others that lack them. Take a look. 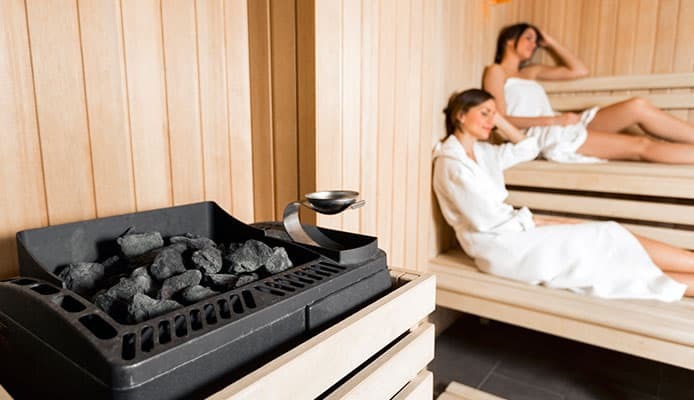 Several types of rock are popular among sauna enthusiasts, but igneous (volcanic) rocks hold the number one spot. 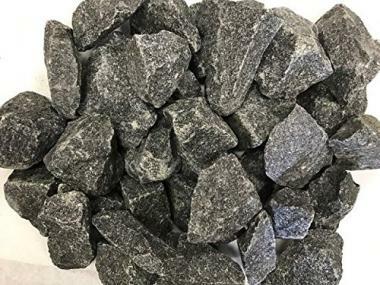 There are many reasons people choose lava rock for sauna – it absorbs heat well, it’s stable, it doesn’t explode and shows great durability. In this category, the rock most commonly chosen is granite. It has all of the upsides we mentioned earlier, making it a great fit anywhere. If you decide you wan’t to go with another type of stone or you want to go out and collect the stones yourself, you should keep a few things in mind. The stone you get shouldn’t be porous, because these can absorb water and deteriorate faster. Rocks should also be without cracks – they are a way for water to get in which can lead to stones exploding (and you don’t want that). Of course, your new rocks should tolerate heat and chemicals well, so you don’t have to replace them constantly. You will be glad to hear that rocks are pretty much universal, and they pair well with any type of heater. They are tested to endure high temperatures, so you really have nothing to worry about – no matter if you have gas, wood fired or electric heater. Of course, some saunas don’t use rocks at all, for example infrared saunas or portable saunas. Infrared saunas use infrared rays to heat your body directly, while portable saunas have a totally different design which primarily concentrates on sauna weight loss. The size of rocks you pick is also important. Always try to get stones in different sizes to get the best possible effect. An average stone should be sized like a potato, with larger and smaller stones in the package too. Large stones retain heat better, so they are great for maintaining temperature. On the other hand, smaller stones create better steam when you splash them with water. Combining these properly when piling up the stones on your heater will allow the air to circulate easily. Products featured in our sauna rocks reviews offer a variety of sizes so you can set them up easily. Q: What Are Sauna Rocks? Why Do I Need Them? A: These are a rocks which are suitable to use in a sauna, in other words rocks that hold heat well and aren’t damaged by it. You need them to keep your sauna hot and at your desired temperature, even when the heater is off. They are also used to increase air humidity inside the sauna, by pouring water over hot stones. In addition, stones make using the sauna safer, since using just the heater without stones presents a fire hazard. Q: How Often Should I Replace My Sauna Rocks? A: It’s time to replace them when you start noticing signs of deterioration. These stones won’t hold heat like they used to after a certain number of uses, and then you should think about getting new ones. Some people say that you should replace them once a year if you use your hot stone sauna on a weekly basis. While this is true, it also depends on the type of stone, heater temperature and whether you rearrange the stones from time to time. Repositioning the stones will prolong their lifespan, and postpone replacement time. The reason for this is that bottom stones are exposed to greater heat, and if you just keep them there they will deteriorate much quicker than those on top which are also cooled with water from time to time. If you switch their places, you even out the wear so you can use them longer. Q: How Much Water Can I Splash On My Sauna Stones? A: It’s recommended to use smaller amounts of water when splashing the stones, and there are several justified reasons for this. It’s better for the rocks – you’ll get nice steam without interfering with rock temperature. Pouring too much can cool the stones, and you also risk flooding the heater which should definitely be avoided. This being said, cold water creates nicer steam but it will also cool the stones quicker, which makes sense. All this depends on your personal preferences and the length of the sauna session, but our general advice is not to overdo it. Keep in mind that you need to allow the heater and the stones to get hot before you start splashing water over them. Also, it’s smart to use a ladle instead of doing it with your hand. The reason for this is that steam is very hot and you want to avoid potential burns on your hands. In addition, if you decide you want to add some essential oils to the mix, always add them to the water first instead of pouring them directly on the stones. It’s clear that high-quality rocks are a big part of any sauna experience. For this reason, you should take your time and find the right type of rock. As we discussed, best sauna rocks are those that hold heat, create nice steam and last long. If you follow our instructions and make a smart purchase, you won’t have to worry about stones for a long time and you’ll be able to fully relax yourself. Have you tried sauna rocks that made it onto our list? Were they efficient in maintaining temperature? How are you satisfied with size? What about longevity? Please share your experience with us in the comment section below.